Yesterday I critiqued the old idea that homiletics is about making truth memorable. I’d like to ponder a similar issue with both affirmation and critique. 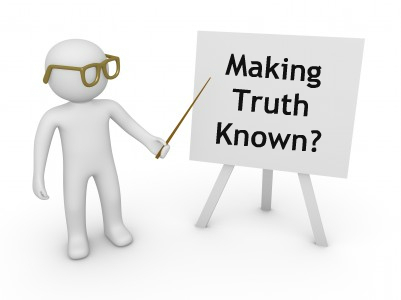 Can we say that preaching is about making truth known? Yes. But not only. 1. We cannot assume that people have knowledge of truth. We live in an age of increasing biblical illiteracy. Actually, we also live in an age of increasing access to information, but increased shallowness in engaging with available information. People are not well-read. Thus it is not wise to assume that people have a certain level of knowledge of the Bible, or philosophy, or history, etc. Assuming knowledge can lead people to either disengage from presentations, or to take that information and wrongly integrate it with their own perceived insight. 2. We must demonstrate the authority for our authoritative statements. We do not live in an age where a person’s perceived authority can be assumed based on position or title. Simply because you are the speaker does not mean much anymore. Thus we have to demonstrate and prove authority for what is said. Obviously we must be well-read and accurate in our handling of information. More than that, we need to help people see for themselves that what we are saying from the Bible is what the Bible actually says. They may or may not accept that the Bible is inspired by God, but we must show that we are not simply giving our own personal take on what it says. 3. We must recognize that truth statements alone will not suffice. We should be declaring truth, but let’s be sure to proclaim a person. People are trained to hold any truth statements at a distance, but we are wired to engage with other persons. Thus we don’t just state truth, we proclaim Him. We have to have an authentic personal relationship with the One we then seek to offer to others. We need to speak from a life of authentic integrity, not performing, but sharing genuinely. And we need to recognize that we are not simply addressing a brain in a body, but a person whose heart determines the value system of their life. Your trinity of points concerning the foundational and three-dimensional qualities of obedient preaching of God’s word is astute in these contemporary times. The days of Spurgeonism and eloquence of speech are lost in the shadows of antiquity; however, these three, razor-sharp points mentioned in uour posting fit like sword to well-oiled sheath: allowing the sword of truth to be drawn and put into play instantly to cut both ways in rightly dividing His eternally objective truth in the 21st century church.